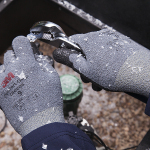 "I’ve found these to be excellent in keeping my fingers warm as well as being better to work with, grip wise and flexibility wise"
ST. PAUL, Minn.--(BUSINESS WIRE)--Electricians, contractors and other industry professionals now have double the options for 3M brand safety gloves. From cut resistance, to winter wear, to touchscreen finger and thumb tips, three new gloves from 3M help increase versatility, protection and convenience for a host of applications and environments. A staggering 100,000+ workplace hand injuries requiring time off were reported to the U.S. Department of Labor Bureau of Labor Statistics in 2013. When worn correctly, 3M safety gloves can offer a strong defense against many common workplace hand injuries. The full lineup is now available at 3M.com/newgloves. New 3M™ Gripping Material High Dexterity Work Gloves, comprised of thousands of micro fingers, provide excellent grip in dirty, wet or oily conditions. 3M™ Gripping Material GM530 is sewn into the palm and fingers, helping improve grip and increasing slip resistance. Out in the field, workers can maximize their gloves’ grip by reinforcing their tool handles with 3M™ Gripping Material Tape. The high dexterity gloves have touchscreen finger and thumb tips, and the ribbed, heavy duty spandex creates a snug fit with excellent breathability. 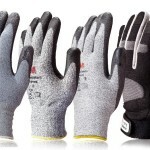 A wide range of uses – factory, maintenance, heavy machinery and outdoor construction work – combined with high quality, premium goatskin leather make these gloves a durable, long-lasting option for multiple worksites. 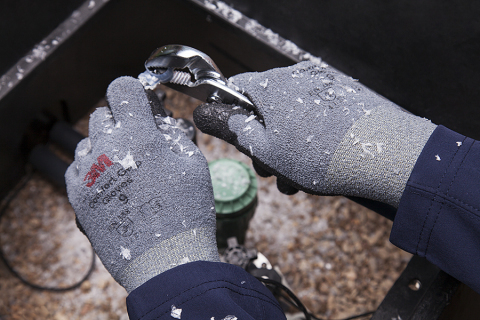 Just in time for the upcoming season, 3M™ Comfort Grip Winter Gloves, provide excellent hand protection and warmth in cold weather applications. The palms and fingertips have a nitrile foam coating to increase grip in wet and oily conditions. The gloves are abrasion and tear resistant and the elastic-knitted cuff is easy to slip on and off while helping keep debris out. Long-lasting, durable and washable, electricians, electrical contractors, and other industry professionals can enjoy increased dexterity with added warmth. “I’ve been swapping them out with firm grip utility gloves,” reported one electrical industry professional. “I’ve found these to be excellent in keeping my fingers warm as well as being better to work with, grip wise and flexibility wise,” she continued. Also new to the market, 3M has added another cut resistant glove to the 3M™ Comfort Grip Gloves portfolio. The new Comfort Grip Cut Resistant Gloves provide ANSI Cut Level 2/EN388 Cut Level 3 protection and provide the same comfort as 3M’s General Use Gloves with added cut, puncture and tear resistance. Ideal for jobs that require dexterity when handling sharp parts, the versatile gloves are well-suited for tasks such as cable pulling and preparation, wire handling, and forming, bending or machining sharp parts, among others. 3M Comfort Grip Cut Resistant Gloves are still available in ANSI Cut Level 3/EN388 Cut Level 5, and now with two levels of protection, workers have the advantage of customizing their safety gloves to the job at hand. With three new safety glove additions, 3M is doubling the options for workplace hand protection. A new level of cut resistance, touchscreen capabilities and cold-weather wear combine to meet the changing needs of a modern workforce. Visit 3M.com/newgloves for more information on these new gloves and contact your distributor for ordering information.